Our Affidavit of Heirship template is a form to guide you when drafting your own document. The information required in the Affidavit is enclosed in brackets and is in all capital letters. 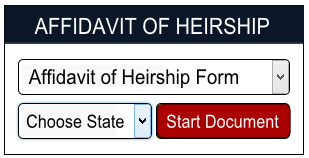 Use this form to help you draft your own Heirship Affidavit. Remember, not all Affidavits of Heirship are the same. Your state may require more information about the Decedent and heirs than our template. Notary Public, State of ______________________.